The Election Campaigns Need Fresh Acts. Will the New Ones Make Us Laugh and Spin? The presidential candidates face a serious dilemma. With almost a year to go before the 2016 election they have repeated their scripts and mantras over and over -- and have exhausted everything they have to say. Does anyone want to hear once again that Donald Trump will make America great again (with details to follow when he is elected President)? Do we need yet another heartwarming narrative from Marco Rubio and Ted Cruz about their immigrant parents' working class struggles? How many more self-aggrandizing proclamations can the public bear before switching channels? So what can they do to stay in the spotlight? New acts? Good idea but, unlike other performers, politicians' new acts can lead to the charge of waffling or playing to the crowd. 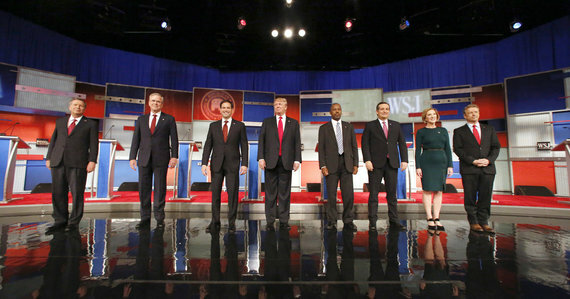 The media has pointed to a possible new scenario for the candidates: Entertainment. After each debate a flood of commentaries rated winners and losers for the best one-liners. Carly Fiorina scored points for her quip in response to Donald Trump boasting that he got to know Vladimir Putin very well because they were both on 60 Minutes. Fiorina fired back: "I have met him as well, not in a green room for a show, but in a private meeting." Fiorina was praised even though, as later revealed, neither she nor Trump had any meaningful contact with Putin. Nonetheless, comedy captures attention. Will candidates now make the rounds of the TV entertainment shows armed with a barrage of one-liners? Comedy writers alert: This may be a lucrative work opportunity. Don't be surprised to see the candidates deliver their routines while schmoozing with the women on The View, cooking with Mario Batali, and trading quips with Jimmy Fallon, Jimmy Kimmel, Stephen Colbert and Trevor Noah. And don't rule out stand-up acts at comedy clubs. But there is one show that could offer the best platform for the candidates: Dancing with the Stars. Donald Trump: El Jarabe Tapatia. With this lively national folk dance of Mexico Trump will demonstrate his love of Mexico and Mexicans -- that is, the good Mexicans, not the rapists and other criminals who sneak illegally into the U.S or are sent here by the Mexican government. Ben Carson: The slow dance. No wild gyrations in the fox trot or box step -- only easy swaying, with methodical, if monotonous, almost imperceptible movements. Hillary Clinton: Tap dance. Fast-paced shuffling and side-stepping will show she can dodge the political bullets shot at her from all directions. Bernie Sanders: Jig and reel. In Colonial America the upper classes preferred "fancy dances" like the minuet. Slaves and lower class whites did informal jigs and reels derived from African and Scottish traditions. In his jig and reel performance, Sanders will demonstrate his disdain for the "fancy" one-percenters. Jeb Bush: The Waltz. Smooth, structured and predictable in genteel three-quarter time, with a closed (but not intimate) embrace of his partner. Bush's waltz will occasionally break out into a flashy whirl, but will promptly return to a restrained posture. Carly Fiorina: Clog dance. Percussively striking her heel and toe against the floor will echo Fiorina's strident style of leadership. The clogging noise will divert attention from missteps, like red ink on corporate balance sheets and precipitous drops in stock value. Marco Rubio: Swing Hustle, sometimes called the Street Hustle. Popularized by John Travolta in Saturday Night Fever, this dance will illustrate Rubio's ethnic roots and show that he's a man of the people, with a youthful charm. Ted Cruz: The Tango. The Ted Cruz version of this dramatic dance will begin with seductive promises and then a sharp reversal that unleashes withdrawal and denial and a look of determination and self-satisfaction. Chris Christie: The Peabody. A fast-paced one-step invented in 1915 by William Frank Peabody, a portly NY City detective (some say fireman). Peabody held his partner to his right side to accommodate his corpulent circumference. Christie's performance of the Peabody will demonstrate that despite his girth he can move swiftly and decisively while controlling the lead. Lindsey Graham: Cherokee war dance. Although historically a peaceful people, this colorful Cherokee dance, with its methodical steps and pulsating drumbeats performed around a fire next to the bright red war flag proudly declares readiness to respond to threats and the resolve to fight aggressive enemies -- a resonating dance for the candidate considered the leading proponent of military preparedness and response. John Kasich: Limbo. Kasich, called the most centrist of the Republicans, will show in his Limbo that he can stay balanced while slithering under an increasingly challenging obstacle. Bobby Jindal: Jazz dance. Jindal will display explosive movements drawn from diverse sources, including ethnic traditions, contemporary styles, and even classical genres such as ballet. Bobby Jindal's dancing will switch from one mode to another, as he menaces viewers with disruptive and unpredictable moves. Martin O'Malley: Hip-hop. Polling nationally at 2-5 percent, O'Malley is not likely to overtake his two Democratic rivals. Since his positions on most issues don't differ significantly from theirs he needs a distinguishing performance that shows energy, flair, and new moves. What better way to illustrate that package than hip-hop, with its gymnastic popping, locking, breaking and contortions. Alas, neither clever punch lines nor polished stepping is guaranteed to swing open the door to the White House. We don't yet know what will keep the candidates on their toes and inspire the public to head straight to the voting booths. Let's hope voters won't confuse wit or razzle-dazzle with statesmanship.